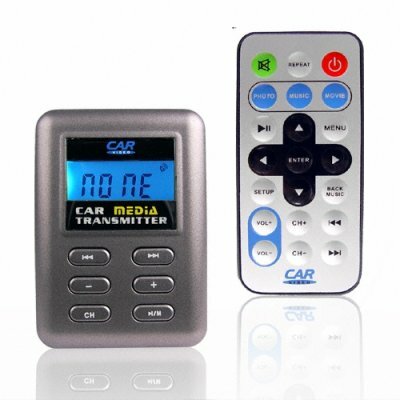 Successfully Added Car Media FM Transmitter - Car Movie + Music Player to your Shopping Cart. Car media MP3 and MP4 player and FM transmitter for a new and inexpensive way of playing your digital movies in your Car without having to buy an expensive car DVD player. Powered directly from your car and with AV OUT and a FM transmitter, all you need is a SD card or a USB flash disk with MPEG1/ MPEG2/ MPEG4/ VOB/ DivX/ AVI movies or MP3/ WMA music and a LCD screen with AV in, and you will be playing your favorite media without any tedious converting, listening to intense sound provided by your own cars audio system, and doing it all by remote for easy control while driving. A high end digital media player for someone on a budget, available direct from Chinavasion with no MOQ..